Lions L held their nerve in the final week and won the division ahead of Whistlers L due to finishing with a superior games difference ratio over the course of the season. At the start of the evening a 6-4 win would ensure the title, even if the Whistlers side won 10-0. The Lions side made absolutely no mistakes and came through 7-3 over Lions M. Val Guilbert, Bolette Hjorth and Jenny Powell all defeated Derek Cave and Diane Le Page to ensure the title was theirs. Powell and Guilbert combined to win the doubles over Sam Totty and Le Page in 4 games. Totty was undefeated in singles competition, dropping just the single end to Powell. Whistlers L finished the season with an 8-2 win over Whistlers M. In the end they missed out on the basis of 5 extra matches lost than the champions. Champions Lions A finished off their season with a narrow 3-2 win over their B side. Josh Butler fought back strongly from a 3-0 deficit to beat Jez Powell in 7 games and was also on hand to dispatch reserve Martin Sarre in 5 games. 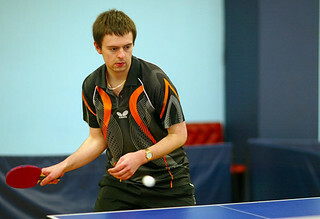 Garry Dodd earned a straight game win over Powell to secure the win, but was defeated by Sarre in 6 games. Whistlers C finished as the runners-up and they were emphatic 5-0 winners over Ravenscroft Panthers A during the final fixture. Dawn Morgan and reserve Ben Foss each picked up singles wins over Sam Clark and Ben Foote before combining to clinch the doubles in 5 games. Lions C finished in 3rd spot and also ended the season clinically courtesy of a whitewash, Whistlers A the recipients of the brush. Paul Hainsworth (pictured) and Liam Robilliard each defeated Mark Pipet and reserve Ian Fitchet in singles and came through the doubles encounter in 6 games. Whistlers B finished 4th and were also 5-0 winners, Lions D the side to suffer the defeat. Joshua and Lawrence Stacey each beat Lions reserves Chloe Le Tissier and Luke Bichard in singles and doubles action. Champions Whistlers E faced Lions I in the final fixture in a match which would decide the averages winner and runner-up. Going into the contest, Whistlers' Kay Chivers and Ben Foss were able to take top spot, as was Lions' Martin Sarre. Things were looking good for Sarre when Tom Ruff produced an excellent unexpected 5 game win over Chivers and he himself defeated Keith Opie in straight games and Foss in 4. The implications of the final match between Sarre and Chivers was fairly simple. A Sarre win would mean he topped the averages and Chivers and Foss would be tied on the same average in 2nd, whereas a Chivers win would clinch the averages for her and Sarre would be 2nd. The game was a good encounter and Sarre was looking good at 2-1 before Chivers took the game to a decider. She went from strength to strength and looked to be heading towards the win whilst leading 8-3, however Sarre dug deep and reeled off 6 consecutive points to lead 9-8. Match points came and went for both players before Chivers sealed it 13-11. The Whistlers side ended the encounter as 7-3 winners. 3rd placed side Lions J left their best performance until the last match of the season with a top notch 6-4 win over the strong champions, St Pauls B. Mike Brehaut and Theo Lepp each recorded wins over Brian Le Cras and Derek Carter in singles and doubles action. Lynn Finn picked up the important 6th rubber with a 5 game win over Le Cras. St Pauls reserve Bob Cherry's best efforts were not enough despite his 3 singles wins. In the end, the St Pauls side only edged the division due to the virtue of having a greater games difference ratio than Whistlers J. The 4th division will be the final to be decided and is also the last to finish, with next week's encounters ending the season. The finish is surely to be one of the closest on record as the teams at the top are separated by just games difference ahead of the final matches. Lions L could rue a costly point that they dropped against 2 man Ravenscroft Panthers E this week. Stefan Sayer won his 3 for the Panthers over Jenny Powell, Bolette Hjorth and Val Guilbert, however it was the other 2 Panthers narrow victories which sealed the draw. Junior Ferbrache picked up an excellent 5 game win over Hjorth and teamed up with Sayer in the all important doubles match. The Lions pair looked dead and buried whilst facing a 2-0 deficit and with the 3rd at a knife-edge at 10-10. They fought back well and managed to pinch the 3rd giving them the momentum to force the decider. It looked like they had pulled off the great escape when leading 10-6 in the final game, however the Panthers pair reeled them back before a wicked piece of luck in the form of a net ball saved a match point. From here they held their nerve and edged it 14-12. Lions L are still just in pole position despite the dropped point as they have a better games difference than Whistlers L by 4 matches. They do though face a tough encounter against their M side in the final week. A 7-3 win would confirm the title for the Lions side, even if the Whistlers side defeat their O side 10-0. There is of course also the possibility of both sides finishing with the same points and games difference.